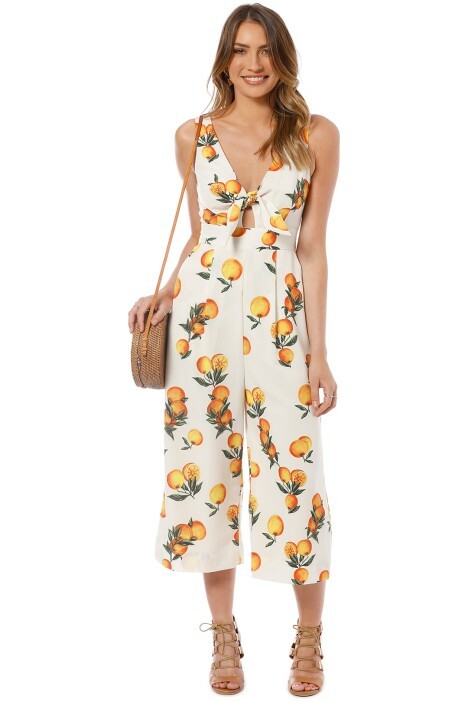 Brighten up gloomy days with Sheike’s Clementine Jumpsuit! Featuring a delectable clementine print, the chic white jumpsuit has a self-tie bust feature and cropped culotte pants with side pockets. Playful and flirty, hire this fun jumpsuit for a daytime event or for date night! Make a cheerful statement at your next daytime event by styling the jumpsuit with light yellow block sandals and rent a structured shoulder bag. Head over to our blog to read about what shoes to wear with jumpsuits. Sheike began their story in the mid 1970s with a market stall and a simple portfolio of wardrobe staples. Staying true to their ethos of style as an expression of self, it has since evolved into one of Australia’s most iconic labels. Focusing on the everyday to the special moments in life, Sheike captures trend with a fun and flirty energy. Ranges including knitwear, resort separates and classic evening wear will become your wardrobe’s new best friend. LENGTH: This jumpsuit is cropped to tea length. GREAT FOR: Athletic, Tall body types. Since sizing and cut varies between dresses and brands, please use this chart as a general guide. The sizing in this chart applies to this item ONLY. If you need assistance selecting the proper size, please contact our friendly customer service team. Clementine Jumpsuit is rated 5.0 out of 5 by 1. Rated 5 out of 5 by Amy from Cute and flattering I have a long torso and am sometimes loathe to risk a jumpsuit despite loving their flair, but this Sheike number was flattering comfy and great fun to wear. No issues with front scrunches, although I wore a size up (10) to try and avoid that anyway. The little detail at the front is sweet and not too overwhelming in the maount of skin it shows, but that may be because I don't have much cleavage to pull it out. The length isn't awkward either and didn't make me look short, which is alwyas a worry with 3/4 cuts. Given it was the holiday season, I wore this to a glamorous breakfast and also out on a daytrip to the beach in the middle of nowhere. It worked in both situations - despite being out in the sticks it didn't look too out of place but also shone at the breaky.